Home / Stories / Back to School! From the beginning giving something back to the communities around where our handmade silver jewellery is made has been an important goal of our business. 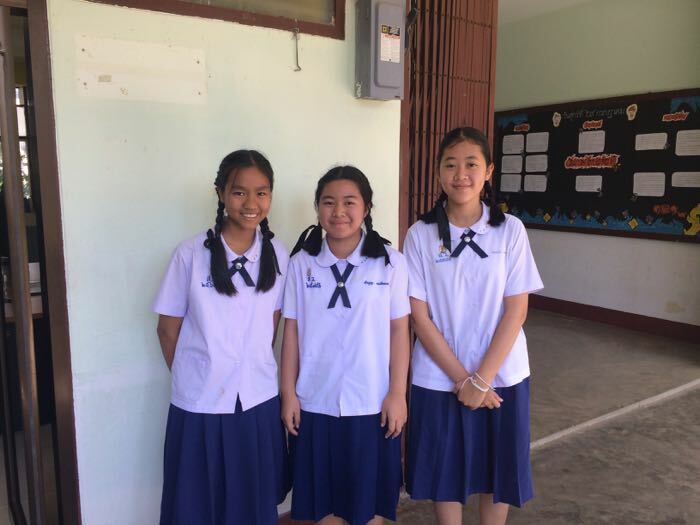 When we made our first contribution to edf.org and were given the names and background information about the three students we would be supporting, our intention was to try and build a relationship with them and help them as much as we could. From the outset we have been really keen to meet them in person. Since last July we have exchanged several letters with all of them. This in itself is quite a lengthy process due to the letters having to be translated from English to Thai and then the responses from Thai to English. In January I arranged the first meeting. 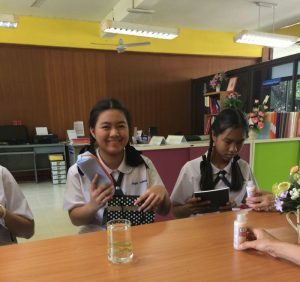 Due to safety rules this needed to be done at the school and we would of course need a translator as the three girls only speak limited English and our Thai doesn’t quite stretch that far! Unfortunately, Alex wasn’t able to join so I was going solo! I have to say I was actually quite apprehensive about meeting them, as I really had no idea what to expect from the whole experience. How would I find it? How would the meeting work? What would be the student’s reaction to me? I was hiring a car and driving myself, the school was about 45 minutes south of Chiang Mai. I had been given the address and directions using google maps. Even so I was a little nervous about finding it (which turned out to be well founded) as GPS can be decidedly unreliable when you are out of main towns and cities here. Anyway being the optimist that I am I was sure it would all work out. I admitted defeat and phoned my contact at the school (one of the English teachers) explained that I was lost and that I would find someone for her to speak to, to figure out where I was. I went back to the last one street village I had past and found the local “shop” there was an elderly lady sitting there… I tried to communicate with her and then gave up and just passed her the phone. It turns out I was about 20 mins away… whoops! The teacher very kindly said wait there I will come and find you. Which she did… So I was meant to be there at 11, and arrived at about 12.30. The meeting was in one of the administration offices- Cream, Warunya and Plaifa, were already there when I arrived and welcomed me with traditional ‘wais’ or bowing. There was the English teacher who was helping translate and 2 office members as well. 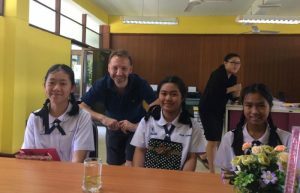 The 3 students were obviously quite shy, but all introduced themselves to me in English with their name, which class they were in and what their favorite subjects were. Math, Science and Thai Language seemed to be the consensus, sadly not English! They all said they do find English difficult. They told me they have 8 classes a day and are with the same class for every lesson and subject, so there doesn’t appear to be any streaming. Classes are usually between 35 & 40 people. I was interested that when we talked about the future they all said that they wanted to go to University. How realistic this is I am not really sure, but I hope that we will still be sponsoring them so can help make it happen. I wanted to try and get a feeling for what they did outside of school, although from their first two letters I got the impression that they did help out around the house a lot or as much as they could. Plaifa was keen to tell us that she liked reading and drawing, she likes reading romance novels, although the last book she read was Sherlock Holmes! I said when I was back in England in February that I would try and find her some Sherlock souvenirs! A big smile greeted this! Cream liked to watch cartoons and Warunya Thai movies. I could tell that Plaifa definitely seemed to understand some of the things that I was saying in English to the translator, I think just her shyness stopped her from letting us know that she did understand. 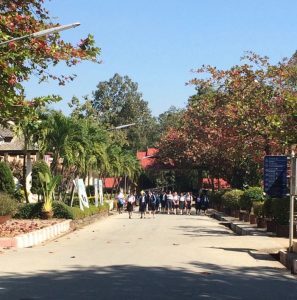 As I said earlier the school was in a small town about 45 minutes’ drive from Chiang Mai. I was amazed to find that only one of the 3 had ever been to the City. We think nothing of driving that distance, getting a bus or train or even getting a plane, the contrast is somewhat striking. 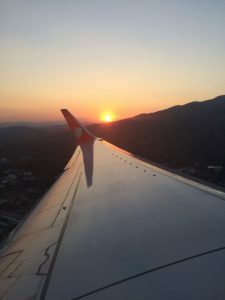 This was again in evidence where we talked about other places in Thailand, and if they could visit anywhere in the country where would it be. Plaifa and Cream both said places that were actually very close in northern Thailand but they don’t have the means to visit them. Warunya wanted to go to the beach! 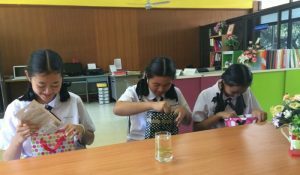 We had bought them each some small gifts, it was great to see their reactions when they looked inside the bags, hopefully in time we can buy them more personal gifts that will help make a difference to something that they like or want to do. It was such a great experience to at last meet the three of them, bringing to life the letters we have exchanged and also the reality of an important part of Maison de Siam. We plan to hopefully go and visit again next term.